Ossos is the only widescreen film in the collection, and the 1.66:1 transfer is very nice. Though there is some grain, it is a byproduct of the film stock, and it adds to the Neorealism of the piece. The actual print is free from blemish or digital glitches. Both In Vanda's Room and Colossal Youth were shot on digital video at 1.33:1, and the direct port from Costa's original source makes for a clean, crisp DVD image. Vanda has some digital combing, but that appears to be a downside of the early DV. All of the movies are mixed in stereo with a conscientious ear that maintains the realistic soundscape. There is a lot going on in these films in terms of sound, be it construction in the distance or the chirping of birds, and everything is placed properly in the mix. The optional English subtitles are easy to read and written with a colloquial style befitting the original dialogue. 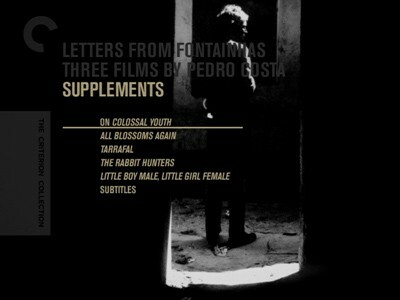 Letters from Fontainhas: Three Films by Pedro Costa is a four-disc set--three DVDs for the movies, the fourth for supplemental features that detail more about Costa. The discs come in their own individual books, with a 44-page booklet being packed in with the bonus DVD. The booklet has photos, credits, and an impressive collection of essential essays about Costa and each of the movies in the trilogy. All the DVD books fit in a side-loading box. * A conversation between Pedro Costa and political filmmaker Jean-Pierre Gorin (33 minutes, 5 seconds) goes in depth into the director's drive to make films and his chosen methods, and where he draws inspiration and meaning. It will set the tone for talks between the two throughout the set. * Interview with the late critic Joao Benard da Costa (9:19), recorded in 2004. 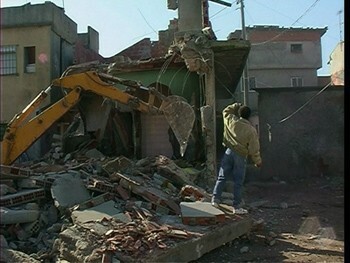 * Interview with cinematographer Emmanuel Machuel (7:54), also recorded in 2004. * Video essay by artist Jeff Wall (13 minutes), featuring Wall talking over clips from the movie, analyzing Costa's visual compositions. Wall is a photographer, and so Ossos appeals to him as a story told in images. * Photo gallery by renowned photographer Mariana Viegas gives us a smattering of black-and-white pics of cast and locations. DVDs 2 and 3 have less than the first disc. In addition to theatrical trailers for their respective films, the bonuses continue the conversation between Costa and Gorin. 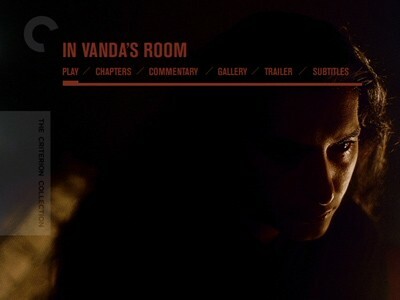 On In Vanda's Room it's an in-depth audio commentary that really digs into Costa's intentions and technique; for Colossal Youth, it's another video chat, this time 23-minutes long. In Vanda's Room has the added bonus of a photo gallery by Richard Dumas. 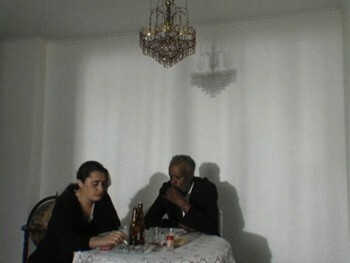 DVD 4 is all supplemental features, and it focuses on material that illuminates Pedro Costa the artist and his mission, including short works the director made that directly relate to the movies contained here. This disc leads with an audio commentary covering a handful of scenes from Colossal Youth. Running just over 38 minutes, it features critic Cyril Neyrat in discussion with author Jacques Ranciere. 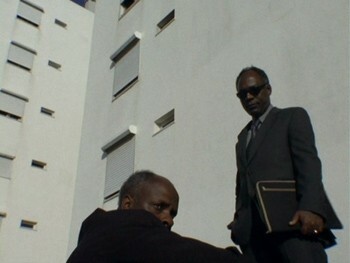 All Blossoms Again is a full-length documentary (1 hour, 20 minutes) on Pedro Costa made by Aurelien Gerbault in 2006. 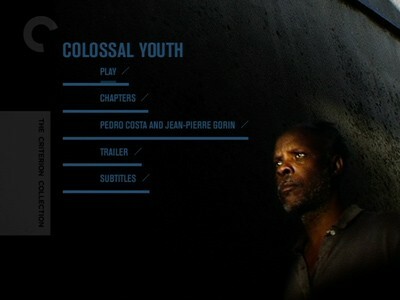 This was shot alongside Colossal Youth and shows the director on set and gives him further forum to talk about the changing face of the slums he has been filming for nearly a decade. Gerbault's style is as distanced and laconic as Costa's, and by showing him at work, meticulously going over scenes, we begin to understand the kind of repetition and endurance required to get after the kind of cinematic art he is creating. In 2006, Pedro Costa created a museum installation called Little Boy Male, Little Girl Female (34:40). It takes leftover footage from In Vanda's Room and Colossal Youth and creates a split screen where we see an exterior scene side by side with an interior scene (or sometimes just two locales), a kind of extended view of life in Fontainhas as it exists both on the street and behind closed doors. Usually, one side is active while the other is passive. There is no translated dialogue, it just runs with the audio as is. Combined with the two short films and the interlocking narrative those pieces share, the gathered footage forms a sort of commentary on the variables of point of view. Recommended. There should almost be some kind of patience test required before you crack open Criterion's Letters from Fontainhas: Three Films by Pedro Costa. If you score high enough, then the three movies contained inside are for you! Costa's reductionist style is like Neorealism to the Nth degree, and his ramshackle narratives are not going to win over a mass audience any time soon. His portraits of the Lisbon slum from which the boxed set takes its name give us a look at poverty and the despair of the dispossessed up close, but there is an inherent distance that suggests we can never fully understand their world unless we live in it. In some ways, I think writing about Costa's movies is actually more interesting than watching them, because things came together for me in the process that I didn't get while I was struggling to get through the movies themselves. The extras included in the set help open up the art, making them essential viewing unto themselves--a rarity in DVD extras these days. If you take the time with Letters from Fontainhas, you will find some reward, you're just going to have to earn it.